Fear sells, and the media loves it. If it’s scary, no matter how tenuous the link or inconclusive the study, you are going to see it on the news. How many times over the years have you heard that your cell phone might give you brain cancer, even though it never turns out to be true? Once such a claim is made, however, it becomes lodged into the public’s psyche and is accepted as true (this is known as anchoring), even after refutations and retractions are published (see Wakefield, Andrew). Typical alarmist fear-mongering. When has any health care professional claimed that radiation is harmless? This is not cutting edge research; Wilhelm Röntgen, the discoverer of x-rays in 1895 and winner of the Nobel Prize in 1901 for his research in the field, advocated the use of lead aprons for protection from the ionizing radiation way back when. Further, trying to lump one study linking dental x-rays to meningioma to another study linking them to thyroid cancer is taking quite the kitchen sink approach. But if there are multiple alleged possible potential theoretical adverse effects from our dental death rays, it must be true, right? Throw enough crap against the wall, and some of it just might stick. Limitations of this study include the possibility of either under-reporting or over-reporting of dental x-rays by study participants. This is a difficult problem in epidemiology, because, unlike medical care, which (at least within cohorts of patients drawn from health maintenance organizations or similar entities) may be confirmed by a review of centralized medical records, dental care generally is obtained (even for a single individual) from numerous dentists, all of which are outside of a health maintenance organization or hospital-based setting, providing little opportunity for researchers to validate dental reports in a timely or cost-efficient manner. No national database of dental treatment exists within the United States; hence, researchers must rely on patient self-report, despite the potential for bias. Let’s play a fun game. We’ll ask you, the astute and intelligent reader of the Prism Blog, to recall your dental x-ray history for your entire life. Can you recall the exact dates when a full series of radiographs were taken? What about a panelipse? Corrected tomograms? Cone beam films? Individual films called periapicals? What about bitewing x-rays? Not very well, did you? Well, don’t feel badly; we’re dentists and we wouldn’t be able to recall our own radiographic history from memory even if threatened with homeopathic hemlock! Asking meningioma patients if they remember having x-rays, and comparing with the memories of people not preoccupied with having brain tumors, is not only inaccurate, but also raises the obvious possibility of reporting bias by the study participants. These types of interviews will only get you “JFK grassy knoll” types of responses – false memories, prompted by pointed researchers, often years (or decades) after the original event(s). We are also concerned that the authors apparently did not survey for other potential confounding factors, such as tobacco history, diet, occupational exposures, etc., or if so, they were not disclosed in the paper. It might even be that having had dental x-rays is correlated with going to the dentist regularly, and that those people are also more likely to see a physician regularly and have a timely diagnosis of medical conditions like meningioma. Or perhaps people who live healthy lifestyles and thus have healthier teeth and gums require fewer dental x-rays over their lifetime. In this scenario, quantitative measurements of dental x-rays are an indirect indication of systemic health, and thus a lower meningioma risk. Who knows, but the point is that there are a myriad of risk factors not considered in this study, and the one variable they attempted to measure was vague and nebulous. Said Dr. Lurie, “They have a table, Table 2, in which they ask the question, ‘Ever had a bitewing,’ and the odds ratio risk from a bitewing ranges from 1.2 to 2.0, depending on the age group. Then they asked ‘Ever had full mouth’ series, and the odds ratio risk from a full mouth series ranged from 1.0 to 1.2. “That is biologically not possible because the full mouth series has two to four bitewings plus another 10 to 16 periapicals. A full mouth series, just to round things off, is 20 intraoral X-rays of which two to four are bitewings. They are showing that one bitewing has 50 to 100 percent greater risk than a full mouth series that has multiple bitewings plus a bunch of other films.”Explaining this gross internal discrepancy is difficult, as the epidemiologic and statistical methods are widely accepted, Dr. Lurie said. He attributes the perceived discrepancy in the data to possible recall bias in the patients involved in the study. The study also found no correlation with cone-beam CT scans, increasingly used in dental implant treatment and providing the highest x-ray dose of any dental radiograph. Take note: in the race to blast the most radiation through your brain, nature is falling a bit behind your hospital, but your dentist can’t get within 2 orders of magnitude of it. That’s why you never see a Superhero (or a Godzilla) mutating out of a dental office to save (or destroy) the world. While hospitals and Mother Nature have veritable radiation bazookas at their disposal, we have but pea shooters. We hope this will help you understand why we roll our eyes when a physician reporter on NBC tells the audience that they should be really be refusing x-rays at the dentist. This is dangerous advice coming from someone outside of their field of expertise. Medical radiation aside, an important question remains: when we all get several hundred μSv of background ionizing radiation through our bodies and brains per year — every year- it seems a bit odd that an extra 10 μSv, even once in your life, would significantly raise your risk of anything to the degree that the Yale study claims. And One More Thing. We are really getting a bit tired of hearing everyone who publishes or pontificates about x-rays opine sagely that x-rays should only be used where necessary, as if they have invented the concept of radiation hygiene. This implies that physicians and dentists routinely take unnecessary x-rays. But this is not a new idea. Keeping radiation exposure As Low As Reasonably Achievable is a cornerstone of diagnostic radiography, and has been for decades. It’s called the ALARA Principle, and it has been taught to everyone who uses x-rays in Medicine and Dentistry for ages. If you go to your dentist (or your physician) and announce that you don’t want any unnecessary x-rays he or she is NOT going to say “no problem — we never really needed the ones we used to take!”. If he or she is any good, chances are that radiographs are prescribed (and that really is the correct term) because the diagnostic benefits of the bitewing or the angiogram vastly outweigh the risks. It’s good to discuss this with your healthcare provider, but bear in mind that doing many invasive procedures (even as simple as fixing a cavity) without the benefit of adequate diagnostic radiographs is often regarded as malpractice, and for good reason. And One More One More Thing. We have devoted most of this blog post pointing out some of the flaws of this study and how it may have adverse effects upon your dental health. We would be remiss, however, if we didn’t point out that the fallout from studies such as these rests squarely upon the shoulders of irresponsible reporting by the media. In a desperate battle for viewers/listeners/readers, these stories are belched to the public uncritically, with fear being the primary angle. Rarely is equal time given to rational responses, and sadly, the personalities who spout the loudest are often physicians contracted with the news networks. This is unfortunate for many reasons; among them being that 1) as doctors, they should know better; they should read the article themselves and be able to interpret it correctly, and 2) their opinion is held in high regard by the public, making our job of discussing it with our patients that much more difficult. We can’t tell you how often we have heard from our colleagues the fallout we’ve received when the Great and Powerful Woozard of Oz (a cardio-vascular surgeon) informed his disciples that one can effectively whiten one’s teeth with raisins and lemons. Not only is that patently false; it’s harmful to teeth, as putting something almost as corrosive as battery acid on one’s teeth is generally frowned upon in the dental community. Stories such as these can often create a wedge in the relationship we dentists try so hard to establish with our patients. Finally, dentistry is by necessity somewhat more reliant on routine radiographs than other health professions because we deal primarily with hard tissues subject to diseases that are often invisible without some radiographs. Keep in mind that tooth decay and periodontal disease are among the most prevalent diseases of the human race, and early detection and treatment are critical to good oral and systemic health. 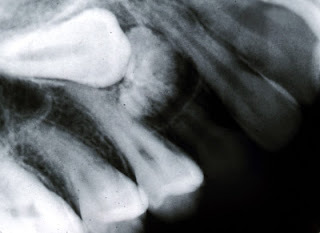 Without radiographs, we often cannot see decay until it reaches the nerve and kills your tooth, or the impacted wisdom tooth until it has damaged the tooth next door, or the asymptomatic abscess until it puts you in the hospital. Occasionally, we discover pathological processes, including the rare case of oral cancer long before they would manifest clinically. A timely x-ray, even in someone with no symptoms, could save a life. We as a profession readily accept the radiation burden in a bitewing or full mouth exam because of the obvious benefits for the well being of our patients. When we order any X-ray exam, we have made the determination that the benefit outweighs the risk and the risk of such exams are much less than those risks we commonly accept in daily life. We do not take this responsibility lightly. So, do dental x-rays cause meningiomas? We have criticized the original article and the reporting thereof, but the fact remains that we don’t know. They might, of course, but unfortunately the article only gives us a smattering of data, obtained from a sloppy study, that may or may not be relevant. The signal to noise ratio contained in this study was too low to be of much use, and it’s hard to understand how higher-dose x-ray exams could be safer than the lower dosed single bitewings, or why far higher doses from other sources would not contribute to the same problem. Hopefully a more thorough study will be done to add to our body of knowledge and either confirm or refute the findings of the original article.